Performed at the Shaftesbury Theatre, London. A musical play by Marc Ambient and A.M. Thompson. Music by Lionel Monckton and Howard Talbot. Opened 26th April 1909 - ran for 809 Performances. Starring: Phyllis Dare and Florence Smithson. Editorial and Photos all as published in 'The Play Pictorial' No. 82 (1909). FIRST of all I must put on record my sincere appreciation of Mr. Robert Courtneidge's share in connection with the production of "The Arcadians," for in pieces of this kind the master mind which rules the stage is responsible in no small measure for the general success, and as a "producer" Mr. Courtneidge is without a 5uperior. The scenery, the grouping, and the general stage effects are pictures of delight for the eye, and do full justice to the entertaining "book" provided by Messrs. Mark Ambient and A. M. Thompson and the charming and consistently melodious music composed by Messrs. Lionel Monckton and Howard Talbot, Who have been well fitted with lyrics by Mr. Arthur Wimperis. 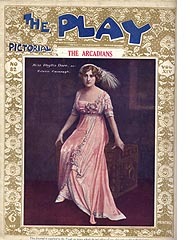 A more exquisite or amusing entertainment than "The Arcadians," has not been seen since the days when genuine comic opera was the vogue; and the Shaftesbury Theatre, the interior of which has been reconstructed and redecorated out of all recognition, should be crowded nightly for many a month to comme. The central motive is Gilbertian in its whimsicality and the adroitness with Which it is developed. In the first act, a romantic glade in Arcadia, an exquisite sylvan scene, we see the sudden appearance of Mr. Joseph Smith, a prosaic restaurant proprietor with a passion for aeroplanes. He exhibits no less surprise than the bewitching Arcadians, and in the course of mutual explanations he tells a lie, whereupon he is immersed in the Well of Truth, from which he emerges in the scanty costume of Arcadia, with a luxuriant head of hair and minus the mutton-chop whiskers which previously adorned his face. It is then decided by the beautiful and enthusiastic Sombra that he, now christened Simplicitas, shall in company with her and the pretty Chrysea, descend to earth to "set up the truth in England for ever more, and banish the lie." They begin their crusade at Askwood races, where naturally they cause considerable curiosity, being still clothed in the costumes of Arcady. Here Simplicitas meets his wife, who, not recognising her husband, proceeds to fall in love with the interesting young stranger, which gives rise to much comic "business" between Mr. Dan Rolyat and Miss Ada Blanche. Then comes an opportunity for Simplicitas to distinguish himself. The jockey who was to have ridden The Deuce has been savaged by that ill-tempered animal, and Sombra arranges that Simplicitas shall take his mount. The Arcadians have the gift of speech with animals, and at the approach of Simplicitas the brute becomes as gentle as a 1amb. An exciting and extremely well managed description of the race follows, and Simplicitas, with his arms around the horse's neck, rides in a winner to the great satisfaction of its owner, ]ack Meadows, who has staked his all on the event, including the hand and heart of dear little Eileen Cavanagh, who has for her representative Miss Phyllis Dare, with a most piquant Irish brogue and captivating manner. The daintiest performance in the piece is the Sombra of Miss FlorenceSmithson, who bears herself like a Peri and sings like an angel. A sweeter and more unforced voice has never been heard on the musical comedy stage. Her success was immense. Another excellent vocalist is Mr. Harry Welchman, who may be described as the love hero of the plot. There are two master comedians in the company. Mr. Dan Rolyat sings and plays in his own inimitable manner as Smith, and keeps the audience in roars of laughter, while Mr. Alfred Lester as the sad-hearted jockey who had never wOn a race is equally amusing. His song, "I've gotter a motter---always merry and bright," is one of the funniest things in a piece which is brimming over with humorous entertainment. Miss Ada B1anche is very diverting as Mrs Smith. There is not a weak spot in the cast, but space forbids that I should deal with each in detail. From "Playgoer and Society Illustrated". Really funny musical comedy has a very large soft part in the heart of the play-going community. Put on a piece that will make the house rock with laughter, such as "The Arcadians," and success is assured! There is a fantastic story running through the play that might perhaps have been worked out differently to greater advantage, but it is late in the day to talk about that, and we don't want more than we get in "The Arcadians". The supply of humour is divided chiefly between Mr. Dan Rolyat and Mr. Alfred Lester, artistes with entirely different styles, so that there is no clashing. The grotesque clowning of the one is as funny as the dry complaining of the other. Miss Phyllis Dare does everything that is expected of her; she dances nicely, sings sweetly and looks pretty, and a musical comedy star need do nothing more. Miss Florence Smithson brings a beautiful voice into play, her singing being quite a feature of the performance. Mr. Robert Courtneidge has given his production a setting worthy of the highest commendation. The scene through which the first act runs is a triumph of the scenic artist's art. Arcadia must indeed be a lovely place to live in! A realistic reproduction of the enclosure at "Ackwood," is another fine piece of work, while the Arcadian Restaurant pictured in the third act is nothing less than a feast of beautiful colouring. "The Arcadians" is playing to full houses at every performance and there is, as yet, no talk of a successor. The public will not soon grow tired of such fare, and I heartily agree with their taste.